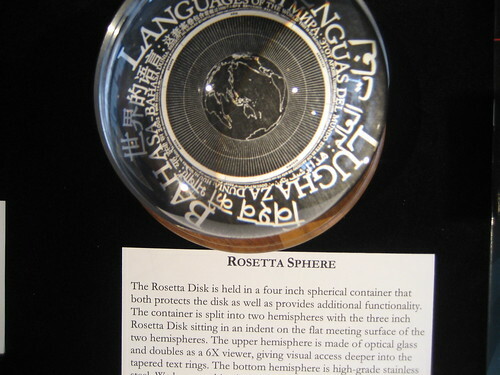 After 8 years of development, the Rosetta Project has released the 1st edition of their Rosetta disks, which have the text of Genesis 1-3 translated into over 1,500 languages, etched in micro text (you need about 1000x magnification to read it all). The idea is that, unlike the single Rosetta stone, these will eventually be mass produced, with the idea that at least SOME of the very durable copies will survive into the distant future when most or all of these languages are dead. There are so many interesting things going on here. They chose optical engraving because, presumably, humans will always be able to see while it’s far less certain that we’ll be able to read digital media, even a few decades from now (an enormous problem for historians – it’s easier to read Da Vinci’s notes than those of scientists working on computers in the 1960s). They chose small but durable mass-production technology because even when some of the copies get destroyed, there will be more. These will be heirlooms handed down from generation to generation, perhaps spread across the solar system or galaxy as we spread out from the surface of the planet (assuming we make it that far). Regarding Genesis… yes we get this a lot. We had a ton of debate about it. It came down to a totally mechanical reason, the bible is the most translated text and it starts with Genesis. Finding John 3:16 in languages you dont know or scripts you dont recognize while scanning documents from a shoebox out of a closet in Papua New Ginea is really hard it turns out. Here is the question I always ask, “Without looking it up, can you tell me what was on the original Rosetta Stone?” It was a bunch of boring tax stuff, but we dont judge those cultures by that material. We are smart enough to know that this was just one piece of text that randomly survived and we are thankful to have it.